found bunny - what breed? I found a group of house rabbits in the woods and was able to catch one of them. In order to feed him properly, I need to determine the breed and approximate age. He (it's a boy) is 2.5 pounds and looks most like a Polish rabbit to me. His markings, however, are not black but rather grey/ dark grey and the one on his back is beige. If he is a Polish rabbit, can I consider him an adult based on his weight? I do not want to give him alfalfa and unlimited access to pellets if he is not growing anymore. 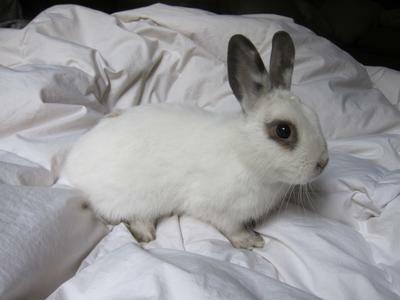 Comments for found bunny - what breed? Color: Entirely frosty white, except for an 1/8 inch black "eyeband" around brown eyes. Color: White, with nose butterfly, eye circles, ears, cheek spots, spine and side spots in these colors: black, blue chocolate, gold, gray, lilac, tortoise.